BCPL was very exciting, and it's a good fit for word-oriented machines, and it comes with a number of demo programs which were useful for testing and also for performance analysis. But this showed up a couple of issues: some programs need 32 bit arithmetic, and the 64k words of memory starts to look just a little cramped. Of course, one can write 16 bit routines to perform 32 bit arithmetic, but revaldinho found this a good point to launch into a new machine development. First step is to expand all the registers from 16 to 32 bits - that's easy. 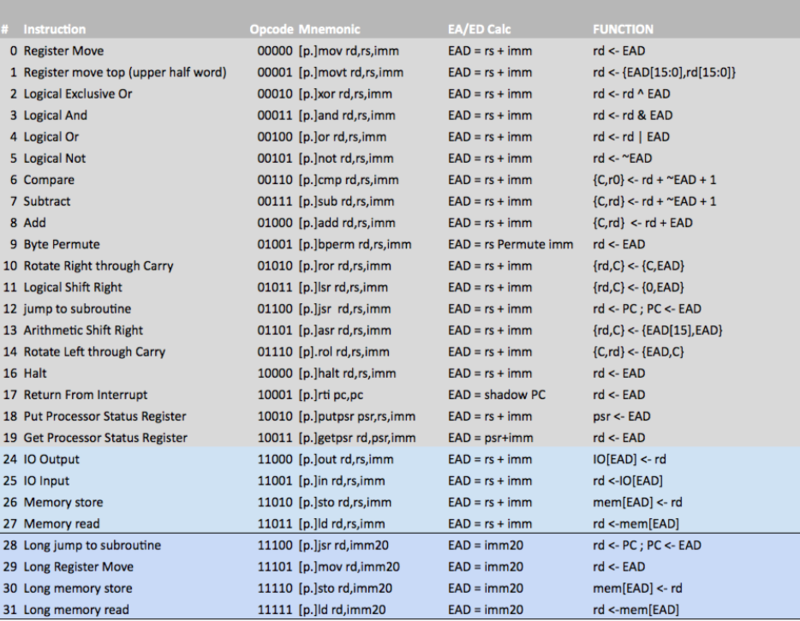 Then, the instruction set. OPC6 has variable-length instructions, some of which can be predicated and others not. The result is a bit complex, especially when fitted (or nearly fitted) into a single page of code. So, the decision is made to go for fixed-length instructions, and also to simplify the code and the initial development and testing by removing the pipelining. With 5 bits of opcode, we can bring in all the instructions from OPC6, remove the few which no longer make sense now that the literal is always present, and we have some room for some more instructions. With such a similar machine to the previous ones, we can also write a script to translate OPC6 assembly to OPC7 assembly, imperfectly and incompletely, ready for hand-finishing. So revaldinho did, and was able to port some assembly language demos. By the same token, hoglet was able to port the OPC6 monitor fairly readily to OPC7 land (although the disassembler needed some work and the single-stepper might still be a work in progress) and revaldinho expects to port the BCPL machinery and begin to extend the BCPL demo suite with some 32-bit wonders. I may have some details wrong, but that's a broad outline of the story - more to come! Including an update of our minisite. One wrinkle in the world of 32-bit RISCy machines is how to deal with addresses, which readily fit in a register but may not fit in an instruction. And similarly how to deal with literal values up to full register size. ... so revaldinho reused a trick from OPC6, which is to use the 4 bit source register field as an extension to the 16 bit literal in a few chosen cases. That gives us a 20 bit (signed) reachable address space, which is in fact a useful amount of physical memory - 1M words. For constants, a second tactic is needed - some way to load word-sized values efficiently. In this case, we went for a MOVT instruction to load the top half of the destination register from the bottom half of the effective value, leaving the bottom half of the destination alone. The other discussion, most recently, was about byte-swapping, byte-rotating and byte order. We've got some preference for a little-ended machine, inasmuch as that means anything when we don't have byte addressability, but for example reading multibyte hex in srecord formats does mean we see big-endian data, in a sense. Anyway, revaldinho came up with the BPERM instruction which permutes the bytes of the source according to a lookup table in the literal, which allows for byte-swapping, half-word-swapping, byte rotation and other useful possibilities. It also turns out to be cheap, in both time and space. Lightning update: the merge is now in, so the master branch now has all the OPC7 goodness, and the minisite has the OPC7 spec. We've made some real progress in the past week: Dave wrote a ROM so the OPC7 can act as a second processor to a 6502-based BBC Micro, which gives us keyboard, video, serial, sound, filesystem service, Rich made a great leap forward with the BCPL backend, and I was able to transmogrify Dave's existing C model of the OPC6 into an OPC7 - with a bit of help from Dave. With that C model, we can run in a Pi-based second processor connected to the Beeb's Tube interface, and with the existing HDL we can run in an FPGA-based board similarly connected. In porting from OPC6 to OPC7 we had to address many upgrades of things from 16 bit to 32 bit, and deal with the implicit sign-extension which OPC7 gives to short literals. We were also briefly caught out by 'pop' changing from a single instruction to a macro. If the first instruction of the macro updates the PC, then the second instruction isn't going to be executed! I think we run, on the Spartan 3 FPGA, at 50MHz, with two clock cycles per instruction. Once everything looks good and we have code to run, Rich has ideas for a more aggressive microarchitecture. case op_bperm: // pick off one of four bytes from source, four times. But the main point is that in hardware it's quite simple: just a bunch of muxes and some minimal decode and some AND gates. And as this permutation happens in the effective address calculation, it doesn't hit the critical path - it runs in parallel with the usual function which is an addition. Thanks for the update on OPC7 - and very pleased to hear that Dave took the time to try it out on the BlackIce board - albeit using the ICE40's internal BRAMS for 32bit wide storage. Interesting to hear that there is now the possibility with the OPC7 of a general purpose 100MHz cpu that can now be implemented in a Spartan 3 FPGA - and work as a co-pro to the venerable BBC micro. I was specifically interested in the byte permutation method - as this hints at a way how the contents of a small number of registers could be accessed and manipulated within a stack based machine. I neglected to take a photo of that setup. Soon after that the focus shifted to get the second-processor version running. We did have some trouble, which Dave has very recently fixed, caused by our decimal print routine being a bit too 16-bit, so Dave has replaced it with a more general word-sized decimal print routine. We don't (yet) have a single-step trace in the monitor code, so emulation is the best way to dig into the detailed (mis)behaviour of the machine - or the code. At the same event, Rich did much of the finishing off of the BCPL backend for the OPC7. Today, we have a fair number of BCPL test programs and a working core and ROM to run them on. I should run some and take some photos. There might yet be space in the BlackIce to fit both the BBC host and a second processor, and that would be a nice, affordable, self-contained environment to play with the new CPU, in a world with well supported input and output and a filing system. Running test cases from an SD card beats having to paste them in as srecords, and there's no need to write a filing system for the new CPU, only the small ROM to interface with the host. Both the BlackIce and the GOP platforms have narrow SRAM compared to the 32-bit machine width, but as Dave was previously able to interface the 16-bit OPC6 with the 8-bit wide RAM on the GOP, I would imagine the same kind of tactics would handle the width mismatch on both platforms for the OPC7. There's a performance penalty of course, mitigated to some effect by implementing a small instruction cache. It will be good to see something like bperm popping up in a stack-based machine! I'll pause now, in case I'm spoiling your fun!!! As it happens, my setup at the time wasn't recognising my serial adapter so I couldn't follow suit - I was in Leicestershire and Dave was debugging in Bristol. We've never tried to use this with BlackIce - I would anticipate issues, because the cache ends up being built with large numbers of discrete registers. But even without the cache it would be useful. I've slightly changed my mind about the preference for bringing up a new CPU as an Acorn copro - it works very well for those of us who've already internalised enough Acorn knowledge, but having a serial connection to a sufficiently useful monitor program might be preferable to someone who hasn't. If the monitor program can load code then it can be improved in-place: in our case we use srecord format. In fact, Rich (revaldinho) pointed out that a test framework on a laptop could automatically squirt test code to the CPU and harvest the responses, so one could regression test an update at full speed, instead of waiting for emulation or simulation. For example, python can readily pick files from directories and send encoded data out of a serial port. On the last item, I note that even when targeting Xilinx Spartan 3 or 6, the memory controller cache uses discrete registers rather than distributed RAM. I don't really understand why this is, so it probably merits further investigation. The cache is one-way-direct-mapped, and there is a single tag comparator. The bperm instruction reminds me of the BMM (bit matrix multiply) instruction which can also do permutations found in some machines. BMM probably requires more logic resources though.